Work Center can be regarded as a single machine, multiple machines that are similar or a work place, like a workbench, shipping area, a CNC machine or assembly line. Each work center carries its own burden setup, so the system will calculate burden cost based on these values for production at this work center. Also, the way to operate the machine is defined through the Machine Hour Calculation Method. Description of this work center. 4 alpha-numeric characters. Can be blank. Multiple work centers can belong to one department. By assigning a department ID, it is possible to evaluate the performance of work centers and summarize the evaluation for the department. If department ID is given, most of the following fields default to values in the department file. Labor Absorb Account for this work center. Different labor absorb accounts can be defined for different work centers. Defaults to BOMP Global Setup or Department file. Burden Absorb Account for this work center. Different burden absorb accounts can be defined for different work centers. Default labor grade for direct labor at this work center. Any operation in this work center will default to this labor grade in the operation file. Default labor grade for shared labor at this work center. 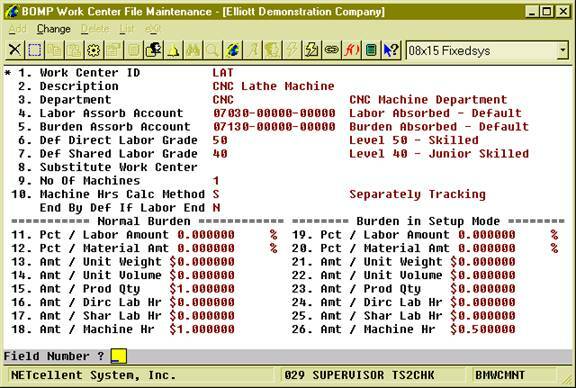 Any operation in this work center will default to this labor grade in the operation file. The substitute for this work center. If there is more than one similar work center function and it is possible to change the production routing from one to another, this field defines the substitute for this work center. The operator can change the production to this work center in certain situations. Number of machines in the work center. One work center can represent more than one machine. This field indicates how many machines are in this work center and the system will give a warning if an operator tries to report work on more machines than the capacity. 0 - This work center has no machines or the capacity should be bypassed. This field indicates how the machine is operated and so defines how the machine hours will be collected for production at this work center. S - There is no direct relationship between Labor Hours and Machine Hours. This may be a situation where the machine can run independently without an operator involved, like a Computer Numerical Controlled (CNC) Machine. This determines the default of whether a machine will continue or be suspended when an operator leaves it if the Machine Calculation Method is “S”. The operator can override this during production. 10 numeric digits with 6 decimal places and an optional minus sign. Normal Burden from percentage of Labor Amount. Normal Burden from percentage of Material Amount. 12 numeric digits with 6 decimal places and an optional minus sign. Normal Burden from per unit of parent item weight. Normal Burden from per unit of parent item volume. Normal Burden from per piece processed in production. Normal Burden from per hour of Direct Labor. Normal Burden from per hour of Shared Labor. Normal Burden from per Machine Hour. Burden in Setup Mode from percentage of Labor Amount. Burden in Setup Mode from percentage of Material Amount. Burden in Setup Mode from per unit of parent item weight. Burden in Setup Mode from per unit of parent item volume. Burden in Setup Mode from per piece processed in production. Burden in Setup Mode from per hour of Direct Labor. Burden in Setup Mode from per hour of Shared Labor. Burden in Setup Mode from per Machine Hour. These parameters allow the operator to configure burden driven by different reasons, either when a machine is operating normally or when a machine is in setup mode. There are two sets of burden parameters for each work center, one for the machine in setup mode and another for normal mode. Setting these parameters to accurate values requires experience. However, a quick suggestion is to compare the overhead amount each month with information accessible at the time, like the labor dollar amount of that month, labor hours or machine hours. They initially can be reasonable estimates and tuned over time to provide a better estimate for production burden cost. Based on figure 14, in normal mode, each processed parent item would cost $1 and each machine hour used to produce it will cost $1. So if 10 pieces were produced and the process time at this work center was 2 hours, the burden cost would be $12 ($1 x 10 + $1 x 2).